Summer is officially here. Cottagers have fled to the country to relax far from home. Trailer parks have filled up with families looking for fun in the sun. And those left behind are looking for ways to beat the heat in the middle of the sweltering city. If you’ve got a pool, now is the time to use it! If you don’t, better make friend with your nearest neighbour that has. If even that seems like a stretch, take heart in the fact that you aren’t alone. Are you one of those folks? Don’t sweat it. Someone has to keep the economy going, right? The weekend will be here before you know it, but in the mean time there are plenty of ways to keep cool in your own backyard. Plan a backyard picnic. Carve up a watermelon. Pull out your beach umbrella and sit with your feet in a kiddie pool full of ice. Refreshing! 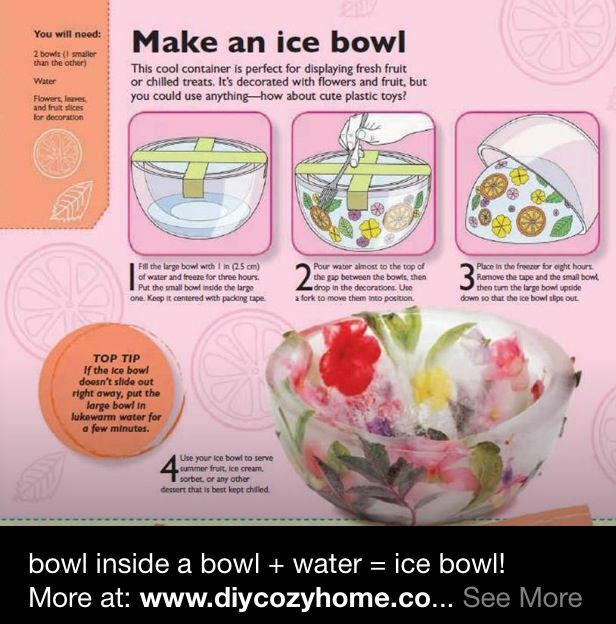 How about making an ice bowl full of your favourite summer drink? Fill it full of edible flowers (ie, nasturtium, pansy, roses, day lilies, lilac, etc) or fruits (orange, lemon or lime slices) before freezing for a beautiful display piece that people will talk about long after the punch is gone. If you have work to do around the yard, why not beat the heat by tackling your garden projects early in the morning or later in the day. Avoid the scorching mid-day sun and fit in a siesta instead. Sprinklers aren’t just for the kids anymore. If you have to water the grass, gardens or trees in your yard, why stop there? When the temperature hits 30°C and keeps on rising, shed your inhibitions with your shoes and run through that cool water once or twice. Can’t beat feeling like a cool kid again. Time to ditch the oven for the barbeque. You don’t want to heat up the house any more than it already is. Steaks and burgers are always welcome, but why not expand your bbq repertoire with pizza, veggies or even fruit! Anyone for stuffed peaches on the grill (via bbq.com)? Wash and halve peaches. Remove pit. Place peaches on aluminum foil so that you can fold up the foil and seal the peaches in. Spoon 2 tablespoons of berries into each peach half. Sprinkle 2 teaspoons of brown sugar on each and 1 teaspoon of lemon juice. Fold up foil and seal. Place on hot grill and cook for 15-18 minutes Turn once. Serve right out of the foil. What’s your favourite way to beat the heat? Today is the last day of school for London and area children. In a few short hours, the kids will be released from school for the summer. Do you have your vacations booked? Is your car packed for the cottage? Are you ready to celebrate the Nation’s birthday this weekend? That’s right, not only do the kids get to celebrate the end of school, but summer is going to be ushered in with Canada Day celebrations this weekend! Start the celebrations off early in the neighbourhood of Summerside. On Saturday, June 29th, the Summerside Optimist Club is sponsoring Canada Day festivities from 3-6 pm at Meadowgate Park. There will be inflatable bouncers, a kids dash, face painting, a maze, a BBQ by M&M, plus lots of other games and activities. Once the sun goes down, the sky will be lit up by fireworks. Glow sticks and snacks will be available to purchase as well. All profits go to further activities in Summerside, so make sure to get out and celebrate in your city. Eldon House is getting in on the patriotic action as well. London’s oldest residence will be hosting free events in the garden between 12-5 pm. That includes live music, the chance to watch artists create en plein air, the opportunity to take in a game of croquet, Canada Day crafts for the kids, a puppet show, and even cake at 3 pm. Tours of the house are by donation. The celebrations don’t stop there though. Between 6:30 – 10:30 pm a fundraising barbeque will be held. Tickets are $50. Dinner is served at 8 pm. There will be live entertainment, tours of the house, a silent auction, plus of course one of the best views of the fireworks being held at the Forks. 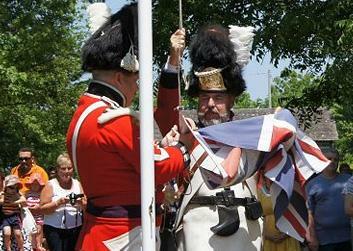 If you want even more historic fun to ring in Canada’s 146th birthday, why not head out to Fanshawe Pioneer Village for their Dominion Day celebrations. You can watch a vintage baseball game, listen to patriotic speeches, enjoy birthday cake and lemonade on the green or a barbeque buffet in the Village Cafe. Admission is $7, with children under 3 free. Buffet prices are $13.50 for adults and $6 for children under 12. Of course the City of London always pulls out all the stops with their Canada Day celebrations down at Harris Park. The free event features a First Nations gathering, exhibits honouring Canada’s Heroes, vendors and community exhibits, birthday cake, and plenty of live entertainment. Celebrations start at noon and run through til fireworks light up the sky after dark. In fact, here’s a preview of what to expect this Canada Day. Have a great weekend and don’t forget to turn your alarm clocks off for the summer! The forecast in London is hot, Hot and HOTTER this week. Summer has arrived on a heat wave that sports our first Humidex advisory. In Canada, a humidex advisory is issued when temperatures reach 30°C or higher. The humidex is really a combination of heat and humidity though, which is a better gauge of comfort levels. As all folks that have lived in Southwestern Ontario can tell you, humidity is the amount of moisture in the air. So a high temperature might be hot, but when you factor in that saturating humidity, the result can be stifling. Environment Canada doesn’t announce humidex advisories just for fun. When the humidex rating inches higher, your body has a harder time keeping up. All that moisture in the air means that your body can’t properly perspire and regulate its internal temperature. You should increase water intake, reduce physical exertions, and seek cooler conditions when possible. Wear loose-fitting clothes, sunglasses, hats, and sunscreen. The elderly, young children, people with compromised immune systems, and pets are all more vulnerable, so require more attention. If you have spent any time outdoors in the heat of one of our heat waves, you know how miserable they can be. Air like sludge isn’t fun for anyone, and that goes for the fit and feeble anywhere. It’s a wonder that it took until 1965 for Canadians to come up with the humidex scale! Here is the Humidex Table and Humidex for Relative Humidity Scales from 100% to 65% from the Environment Canada website. As you can see, it doesn’t take much to go from fine to fried. So how do you combat the heat in Southwestern Ontario? It’s time to dine after dark, ditch the oven for the grille, and take up swimming versus sun worshipping. Remember to drink plenty of fluids (water or other salt-replenishing drinks), and think about joining your kids in the sprinkler (on your water days – If your street address ends with a 0, 2, 4, 6 or 8 you may use water outdoors on EVEN numbered calendar days only. If your street address ends with a 1, 3, 5, 7 or 9 you may use water outdoors on ODD numbered calendar days only). If it’s your off day, head to one of London’s many splash pads or pools. Plenty of them are free, while others host days with reduced admission throughout the summer. Most libraries and community centres have air-conditioned facilities as well. Heck, even a trip to the movie theatre is a great way to entertain the family in a cool environment for a couple of hours! It is well worth the gamble of heat stroke, heat exhaustion, or any of the other uncomfortable aspects that come with our summer humidity. Keep cool this summer Londoners! How many of you made it out to the Kids Expo last weekend? Never fear, as there are lots more festivals yet to come for the 2012 Summer Lineup in London. As I could easily feature at least a festival a week, I thought it might be not a bad idea to give you a bigger heads up, so that you can plan out your festival going this year. You want Greek? Opa! Head out this weekend. Food with an international flair? You’re in luck as the Food festival is this weekend too. There are lots more opportunities to get outside in London, Ontario this summer though. This way, if you don’t live here, you can at least plan on making the trip so as not to miss out on the fun. Take a look! Opa, its time for a taste of Greece with the 2012 Opa: Outdoor Greek Festival this weekend, June 22-24, 2012 at the Hellenic Community Centre at 133 Southdale Rd W. Hours of the festival are Friday – 6pm-Midnight, Saturday -Noon – Midnight and Sunday – 11am-10pm. Go for the music, go for the food, go for the dancing, but just make sure you GO! You want food? You’ve got it! Welcome to the International Food Festival at Victoria Park this coming weekend, June 22-24, 2012, from 11am-11pm. There will be three days of noshing in store for any food aficionados that want to explore Portugal, Serbia, Mexico, Italy, Greece, the Caribbean, China, Poland and more. London promotes green festivals and this one is no different, with manned eco-stations located throughout the park to collect compostables, recyclables and make sure that garbage is streamed accordingly. There will also be vendors on site displaying world craft items, as well as entertainment with an international flair. Get your appetite on London! Get your love of Latin on at Victoria Park on June 30th, 2012, from 11am-11pm at the Caliente Festival Hispano! Latinos love to party and this is a great one that you won’t want to miss. There will be Latin food, live music, exciting vendors and a whole lot of Hispanic culture everywhere you look. It will be a full day of festive fun and the best part is, its free! 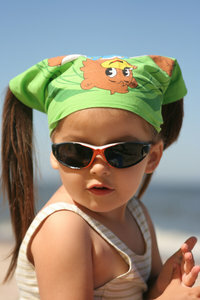 Get ready for a whole lot of sun and fun at TD Sunfest 2012, July 5-8 at Victoria Park! If you like music, you have to attend this raucous weekend affair. This year’s lineup promises to delight audiences with over 30 professional world musicians and jazz artists. And if you thought the Food Festival had the market on nibblies, think again, as you can find Jamaican, Indian, Lebanese, Vegetarian and of course Sammy’s Souvlaki among lots of other tasty treats on offer. Vendors will also tempt your pocket-book with everything from drums to t-shirts, and cellphone covers to a wide variety of international artifacts (think carvings, jewellery and more). There will be something for everyone, guaranteed! While those things are nice, it is the music that really makes the weekend shine and also what helped to rank Sunfest as one of the premiere world music festivals in Canada. Lucky number 13 is what Bluesfest is celebrating this year in London from July 13-15, 2012. Head downtown and point yourself towards Clarence and King, where you will find lots of tents and chairs set up for a whole heap of blues. Get ready to be wooed by the likes of the Motor City Allstars, Sugar Ray and the Bluetones, Howling Diablos, Edgar Winter and plenty more musicians. You better believe that you won’t be crying the blues after attending this fabulous festival. From July 20th to 22nd, 2012, London brings it home with its own brand of folk at the 39th annual Home County Music & Art Festival. We bring the music back to Canada, as over 25 different artists present their styles of roots, traditional and indie folk/pop that will delight young and old alike. Along with the concerts, there are also afternoon workshops, where you will get to hear the musicians tell stories and share tidbits about their music and life on the road. Of course you know there will be plenty of food stalls, but Home County also boasts over 120 different artisans featuring pottery, stained glass, jewellery, textiles, metal works and more. The hours are Friday 6-11pm, Saturday noon-11pm and Sunday from noon-8:30pm. Admission is by donation. Don’t miss this festival! This is a festival with a slightly different bent. From July 22-29, 2012 the Pride London Festival celebrates everything gay, lesbian, bisexual, transsexual, transgendered and everything in between. Grab your rainbow flag and head downtown to take in the culture, art and celebration in a spirit of inclusion, unity and awareness. There will be dinners, art shows, karaoke, outdoor festivals and lots more. Check the website for more details. Put your ear plugs in, get your vintage rock tees out and get ready to thrash as Rock the Park 2012 pulls into Harris Park July 26-28, 2012. Gates open at 4pm and the music runs late, featuring classic bands like The Steve Miller Band, Boston, George Thorogood and The Romantics, then getting more progressive with 54-40 and REO Speedwagon, then hitting modern rock with Slash, Bush and I Mother Earth. Need I say more? And while this is a paid venue, the money raised goes towards Bethany’s Hope, so you can rock on knowing that you are supporting a good cause at the same time. The meat is on the grille and your presence is required at Victoria Park from August 2-6, 2012 for London Ribfest. This mouth-watering festival is anticipated by upwards of 200,000 people every year, and for a very good reason. The RIBS! Well, there is also the vendors, the music, the rides and a few other food things thrown on the grille. What else are you going to get up to over the Civic Holiday weekend? So which festivals will you be checking out London? The real estate market doesn’t sleep. Sometimes the market can be sluggish, but there will always be people looking for a new home. Summertime is no different. In fact, the summer is a great time to put your house on the market, as people often want to move before the new school year begins. If you are looking to list your home this summer, think about ways to make it top-notch for your potential buyer. With a little extra work, you will be well on your way to a SOLD sign in your yard this summer. Declutter – Fall, Winter, Spring and Summer; a clutter free home allows people to see what is on offer. Garage sale season is upon us, so go ahead and purge whatever doesn’t work in your space anymore. Space sells, so make the most of it. A clutter-free house is always more appealing. Open the windows and let the fresh air in – Heavy drapes help to keep in the heat in the winter, but come summertime, you want to lighten up everything in your home. Ditch the drapes for airy shears that let in the light and a fresh cool breeze. Don’t forget to clean the panes while you are at it! Lighten up your linens – Say goodbye to the duvet and heavy fleece. Replace your bedding with crisp cotton sheets and a nice light bedspread in bright and pleasing patterns. Green up your garden – Annuals planted in your garden give that instant bit of colour that everyone loves, plus they last all summer long. Place fresh flowers around the house – They are blooming outside, so why not bring some in. Think fresh flowers in the kitchen, living room, bath, and your bedside table. It will look inviting and add a fresh scent to your home. Pleasing planters – I know you have slaved over your garden beds, but a decorative planter beside the front door will add that extra touch of welcome to potential home buyers before they even step in the door. Take the indoors out – Add square footage to your property by creating an inviting living area outside. Think about placing a bench in the garden, an outdoor sofa near the barbeque and tables nearby to finish your summer living room by the pool. Maintain your grounds – Just because you are headed out of town for vacation or busy with summertime fun, doesn’t give you an excuse to neglect your grounds. Install a sprinkler system. Hire a landscaping company to cut the grass and weed the gardens. Give the kid down the street a couple of bucks to add decorative mulch to your beds. Just make sure the outside is as presentable as the in. Light up your yard– Now that you have beautified the outside, why not illuminate it too! Since people often visit in the evenings, make sure that they can still appreciate all the your home and garden has to offer, by tucking in some spotlights, adding lighting along pathways and the driveway. Its summertime, so lighten up!